Description: Large, sprawling evergreen shrub. Leaves are simple, waxy and lance-shaped with an acute or pointed tip. Leaves are to 6 inches long with long petioles (leaf stems) and are alternate on the stem. Have a wet-dog smell when crushed. Flowers appear at the ends of the branches in panicles (a branched inflorescence), are 1 inch long, waxy, slender and tubular, and abruptly end with five small folded-back petals or teeth. 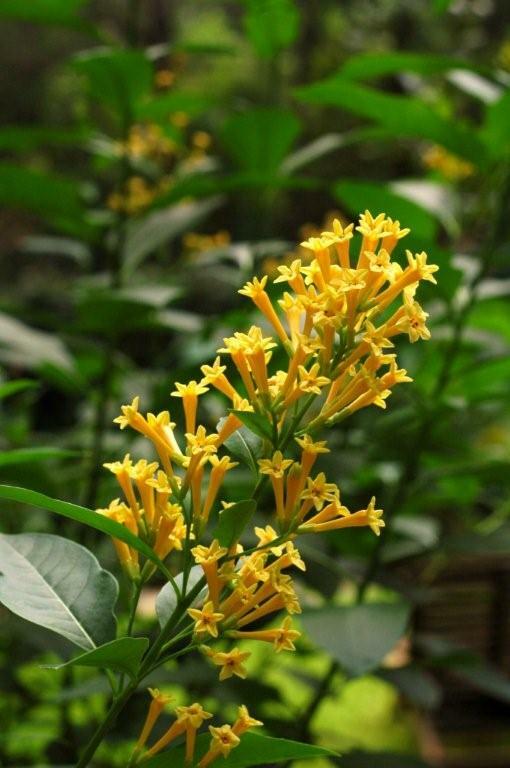 Flowers are not strongly fragrant and the color is yellow to orange. Fruit is a half-inch round berry, usually white. Plant in full sun to look good and attract butterflies and hummingbirds. Hardiness: USDA hardiness zones 8-11, has perennialized fairly well in Dallas/Forth Worth. Height/width: Can grow to 12-15 feet tall, but more often is seen at 4-10 feet tall and 6-8 feet wide. Culture: Tolerant of most soils, including poor and sandy locations. Very drought tolerant once established; plant in well-drained soil with supplemental irrigation available during drought. Uses: Back of borders, along fences, informal hedge, and in large containers for patio and poolside. A good addition to butterfly gardens as the bright orange-yellow flowers appear most of the year in tropical areas, but are heavier in spring and summer. Prunes easily, though leaves are too large for shearing and may require support as it is rangy in growth habit. Heavy pruning can reduce flowering. Moderate to heavy feeder; fertilize with organic products two to four times per year. Mulch well as with all normal palnts. Problems and misuses: Yellow cestrum occasionally is bothered by aphids on new growth, caterpillars and leafminers, though plant is vigorous enough that it rarely requires treatment. Some of these plants are weedy species. Yellow cestrum is considered an invasive pest in Australia. Cestrum species have been reported as toxic to animals and humans if large quantities of foliage or berries are ingested.